Heritage Ireland 2030 is the Government’s new National Heritage Plan and your views are now being sought to make this the best possible plan for our heritage and our communities. The new Plan will address built, natural and archaeological heritage. 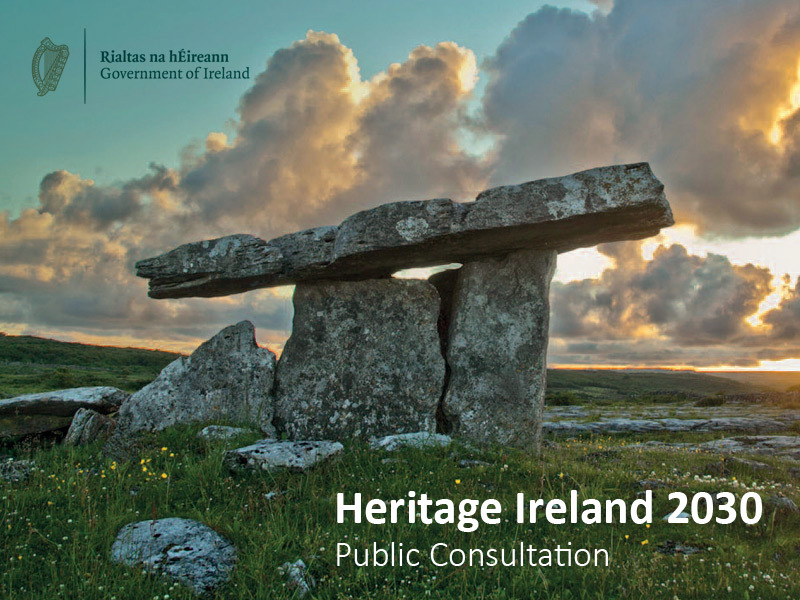 The discussion document can be downloaded at https://www.chg.gov.ie/heritage/heritageireland2030/ and you can make submissions by email (heritageireland2030@chg.gov.ie), via online survey (https://www.surveymonkey.com/r/LBLJHDT) or by post to Department of Culture, Heritage and the Gaeltacht, Custom House, Dublin 1, D01 W6XO. The closing date for submissions is 28 February 2019. If you have a specific issue you’d like to clarify, or if you’re not sure how to write your submission, please do come along and we will help in any way we can. We can’t guarantee we will have all the answers but if we work together we can make sure the final plan is as strong as it can be for communities and for our shared heritage. This is a chance for groups involved in the management and protection of heritage at grass-roots to make their views known to central Government and an opportunity to convey the importance of heritage to local communities across Ireland. One way we can show this is by a large volume of submissions on the plan. Please consider coming to one of the drop in sessions, spread the word and please send in a submission on the draft.